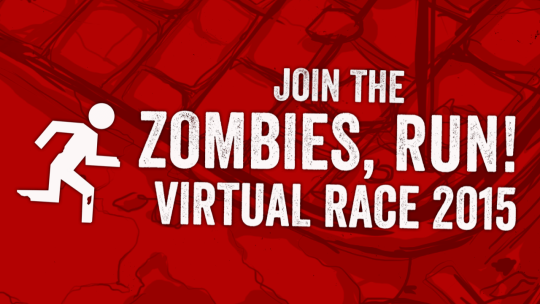 ZR Virtual Race 2015 – Enter Now! – Zombies, Run! ZR Virtual Race 2015 – Enter Now! Running is more fun together — from 5ks to ultramarathons, the community spirit in a race is an incredible motivator. 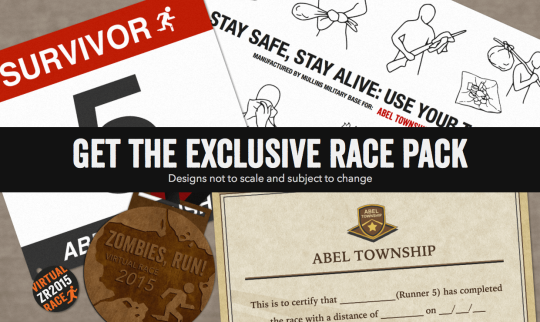 There’s no better community than the runners of Abel Township, so we’re making it happen! That’s right, we’ll be staging the first ever Zombies, Run! Virtual Race from 24th October to 1st November – and entries have now begun! The Virtual Race takes place in a location and time of your choice. You can walk, jog or run wherever you may be, and at any time during the race week, for a 5k or a 10k distance. It’ll be an awesome way for all Runner 5s around the world to run as a community, and get exclusive real-world awards! Entry costs $40 (+$5 worldwide shipping), and Pro Members get a $5 discount! Be quick – there are only 1500 500 places remaining, so join up now to avoid missing out! Just open the Zombies, Run! app and view the Virtual Race news post! If you can’t see it, please restart your device, which will make sure that the news posts are up to date. We look forward to running with you all this October! Next Post The Codex is now on Android!